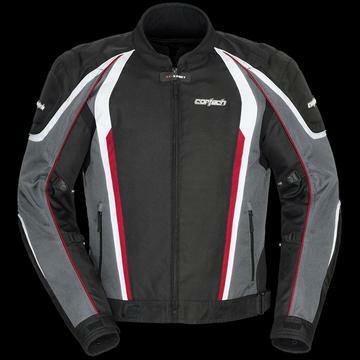 Versatile design and sporty looks, protection, and waterproof protection combine to create a textile jacket that will satisfy any rider’s need whether it be performance or facing the elements. A combination of abrasion resistant 600D Carbolex® and 1600D Ballistic polyester materials keep the rider safe while the breathable and waterproof Rainguard® liner keeps everything dry. Zippers on the front and rear of the jacket combined with a removable 100g thermal liner to help regulate body temperature. Adjustable take-up straps at the bicep and forearm help to adjust the fit and keep the CE-approved armor fitting snugly.